Norman Rockwell oil on canvas painting of Richard Nixon, signed ”Norman / Rockwell” at lower right. Painting is the study for ”Mr. President (Richard Nixon)”, which resides in the National Portrait Gallery, Smithsonian Institution, and was published in the 4 February 1969 issue of ”Look” magazine, captioned ”Weighed, yet buoyed, by the American past and present, Richard M. Nixon, 37th President, faces the future in this Rockwell portrait”. 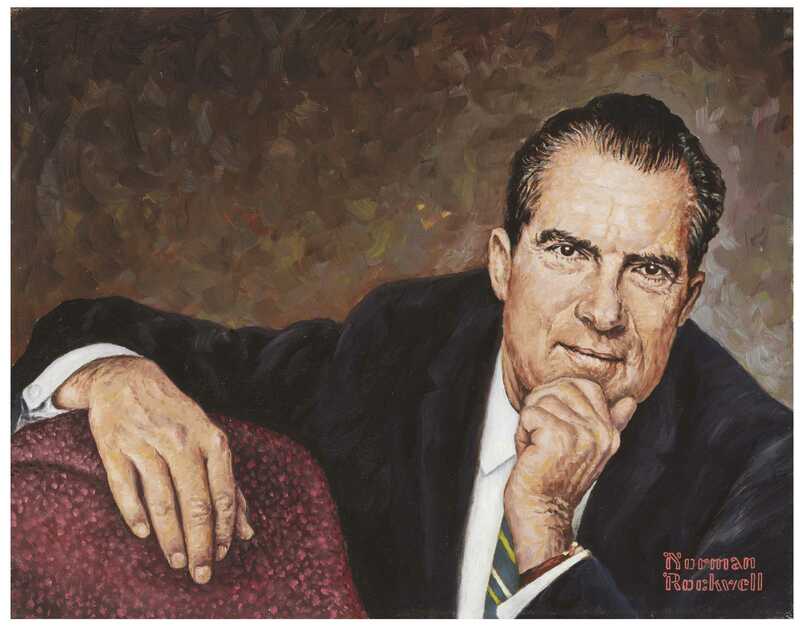 Rockwell painted this study in late 1968 of then President-Elect Richard Nixon, a man whose portrait he found ”elusive” but whose features here are unmistakenly Nixon, revealing at the same time both the guardedness and warmth of the 37th President. As the premiere portraitist of the 20th century, one would expect no less from Rockwell. Oil on canvas measures 14” x 11”. Provenance is from Judy Goffman Fine Art of New York, and then subsequently the Charles E. Sigety Collection. Exhibited at the Mississippi Museum of Art in ”Norman Rockwell: The Great American Storyteller” from 2 March-15 May 1988, no. 64. Painting is in very good condition, with a stretcher bar mark along upper edge. Wax lined, with no inpainting. Sold for $125,000. Around 10 years ago, when looking at a collection from a former advertising executive in wine country north of San Francisco, we stumbled upon this Rockwell art never known or published before. We named it Mr. Apple and we have now sold it twice, both for around $30,000. It is probably a spoof on the great Rene Magritte painting. 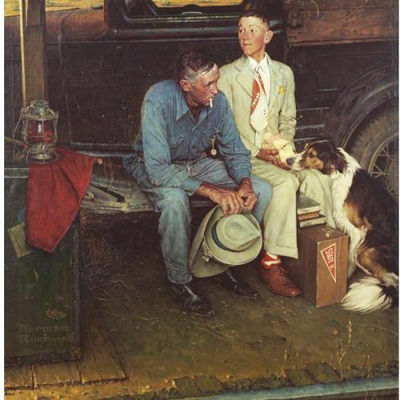 The Rockwell art came with two letters of provenance directly from Rockwell himself. In between the two sales of this Norman Rockwell art work, we sold a Rockwell drawing of Richard Nixon made for the cover of the “Saturday Evening Post.” Rockwell art of “Saturday Evening Post” covers are the most sought after mediums of his art. In case you are wondering what the highest price ever achieved for a piece of Rockwell art is $15,416,000 in 2006. In addition to Normal Rockwell art, we sold a Norman Rockwell personally used paintbrush in our February 2018 auction. Norman Rockwell personally owned and used paintbrush, gifted by Rockwell in 1972. The well-worn brush has clearly been used by the quintessential American artist, whose near-perfect illustrations captured the best of American life and values during the 20th century. Round-tip paintbrush measures 7.25” long, with a black handle and a white ribbed ferrule. Paintbrush is accompanied by a typed letter signed by Rockwell, dated 26 September 1972 to a Reverend Paul John Rich, giving him the paintbrush in lieu of items concerning Rockwell’s Boy Scout paintings. 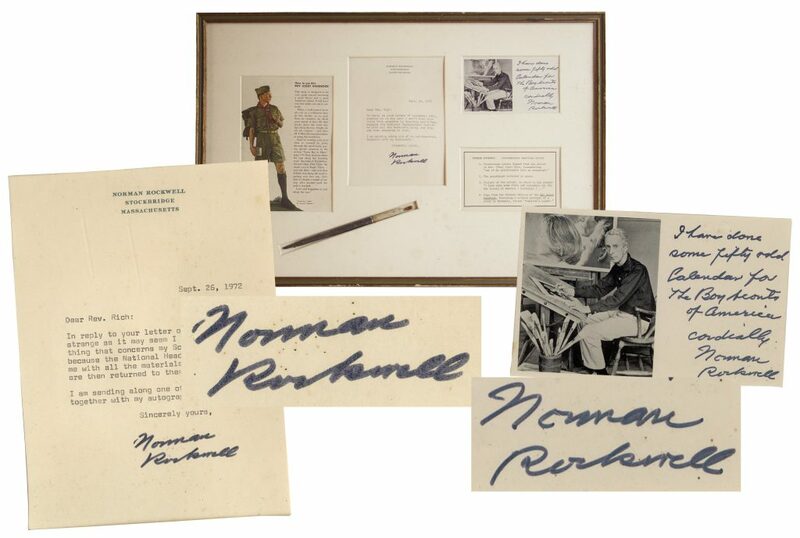 Letter reads in part, ”…I am sending along one of my paintbrushes, together with my autograph…[signed] Norman Rockwell”. Lot also includes a card showing Rockwell at his easel, with a handwritten note, ”I have done some fifty odd Calendars for The Boy Scouts of America / cordially / Norman Rockwell”. All pieces are framed together, along with a page from the ”Boy Scout Handbook” featuring an image of a Boy Scout painted by Rockwell. 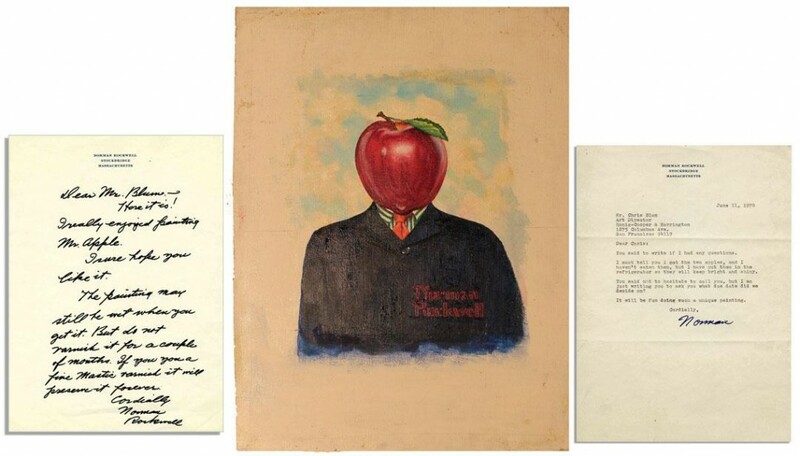 Letter on Rockwell’s personal stationery measures 5.25” x 7.25” and note measures 5.25” x 3.25”. Custom matted and framed to an overall size of 22” x 15”. Some dampstaining to mat and wear to frame, but overall in very good condition. Originally sold as lot 96C in Cornerstone Auction Gallery’s sale in Rhode Island on 15 January 2007. Sold for $15,000.